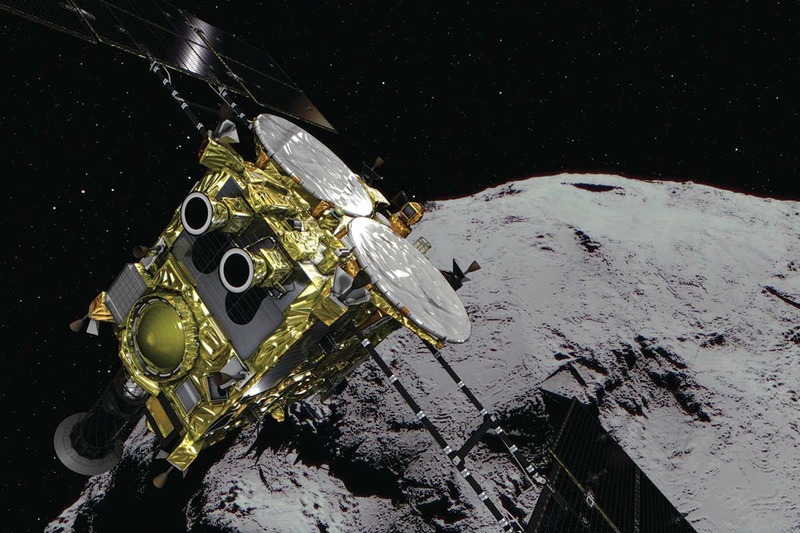 Japan’s Hayabusa 2 spacecraft has begun the asteroid mining era with a bang. Earlier this morning, hovering 500 metres above the surface of the asteroid Ryugu, it shot a copper projectile packed with explosives towards the rocky landscape. It is expected that when the projectile reached about 3.5 metres above the surface, it exploded and sent up debris into the asteroid’s orbit, creating a fresh crater. Mission scientists are waiting for confirmation. Before the explosion occurred, Hayabusa 2 manoeuvred around to the other side of the rock to avoid being blasted by the dust. Later, it will collect a sample for return to Earth. The creation of this crater is just one part of the spacecraft’s mission. Since it arrived at Ryugu in June 2018 Hayabusa 2 has dropped two hopping landers, collectively known as MINERVA-II, onto the surface of the space rock to take pictures and measure the asteroid’s temperature. They sent back stunning images of light skimming over the rocky surface. The main spacecraft also touched down on the asteroid in February and fired a bullet into the ground, spraying up dust that it collected as it ascended again. The latest blast aimed to probe beneath the surface and toss up particles that haven’t been altered by millions or even billions of years of exposure to cosmic radiation. Ryugu is small – less than a kilometre across – and a relic from the formation of our solar system. Studying the material that makes it, in as pure a form as possible, could help us learn about the makeup of early planets and sort out how water and other materials crucial for life came to Earth. In July 2019, the spacecraft will release another set of rovers onto the asteroid, and in November it will begin its journey back to Earth.